The 5 best TVs of CES 2019 | What Hi-Fi? CES is alway fairly TV-heavy, and 2019 was no different. With OLED apparently close to its technical limits and QLED being constrained somewhat by its reliance on a backlight, there was a real sense this year of brands hunting for the next big thing - and the differences in the approaches are fascinating. 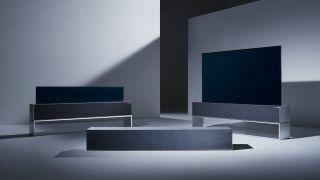 Samsung's heavily pushing Micro LED as the next big evolution of TV tech, LG's stretching the limits of OLED with yet more imaginative designs, Sony's adding 8K to its Master Series, and Panasonic's building Dolby Atmos into its 2019 flagship. Which is the best approach? It's too early to tell, but what's absolutely clear is that the next couple of years in TV Land are going to be very interesting indeed. While we wait for the samples to arrive in our rooms for full tests, here are the specific models that got us all hot under the collar at this year's show. While LG's miraculous 'Wallpaper' OLED maintains its place in LG's 2019 OLED range, it now looks just a little bit ordinary next to the new OLED R. 'R' here stands for 'rollable', and refers to the fact that the panel can be retracted and rolled up within its large, Dolby Atmos speaker-toting stand. Having seem the TV in the flesh we're impressed not just with the rollable design, but also the picture quality, which it shares with the rest of LG's 2019 OLED range. Samsung 75in Micro LED TV - the future of telly tech? Samsung didn't even mention its 2019 4K QLED TVs on-stage at this year's CES (although we did get a behind-the-scenes sneak peak - see below), instead choosing to highlight a new, bigger model in its existing Q900R 8K range and, more excitingly, its first consumer-focused Micro LED TV. Like the previously announced 'The Wall' model, this new, as-yet-unnamed Micro LED set is constructed of smaller modules, but will be sold as a single, 75in, 16:9 TV intended for living room. Why should you be excited about Micro LED? Because it's said to combine the perfect blacks and pin-point contrast control of OLED with greater brightness, longevity and efficiency. It could well be the next big evolution of telly technology. Compared to the first two entries in this list, the Panasonic GZ2000 OLED probably seems just a little bit ordinary. But then, it is a proper product that normal people will be able to buy this year, rather than a highfalutin concept that's way out of reach. Besides, the GZ2000 does have a couple of neat tricks up its sleeve: a new processor that provides a markedly improved picture over its predecessors, and a clever Dolby Atmos implementation that sounded extremely impressive in our demo. This is definitely one to look out for in 2019. They've only been available for five minutes, but already Sony's 2018 Master Series TVs have successors - and this time there's an 8K option. There's still an OLED model - the AG9 - should that be your preference, but to get 8K you need to go for the ZG9. Available in 88in and 95in versions, this huge, rather pretty TV boasts a direct LED backlight and an advanced new upscaling engine to (apparently) ensure all of your 4K-and-worse content also looks great. Samsung didn't even mention its 2019 4K QLED TVs publicly at CES 2019, but the company did treat us to a behind-closed-doors look at the flagship model that will replace the excellent Q9FN - and we left very impressed indeed. To cut a long story short, the Q9FN's replacement appears to have better viewing angles, an even better backlight, and even greater punch and vibrancy. It looks decidedly OLED-like in its performance, but brighter and more vivid. This could be an absolute belter of a TV.